“There are no borders when it comes to helping people,” says Mr Thomas Pang, a volunteer with SINDA. The 47-year-old, who has been volunteering with SINDA for close to 2 years, says his experience thus far has given him more opportunities to serve the community in a fruitful way, as well as to spend quality time with his family. 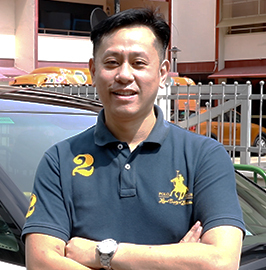 Mr Pang, a Grab driver, first heard of SINDA’s volunteer opportunities through a conversation with a passenger. The idea of helping other people on a variable-time basis appealed to him, and soon he was helping to distribute vouchers and Festive Gift Packs to families during the festive seasons. He also assisted with preparing the vouchers, organising and carrying out distribution drives at residential areas. “I realised that I would be able to volunteer with SINDA, work comfortably and still set time aside for my family,” explained Mr Pang. During the recent distribution drive, Mr Pang took on more responsibilities; leading groups of volunteers, briefing them on their duties, explaining do’s and don’ts and being on-call to help if any issues arose. Additionally, he has had more volunteers assigned to him to help the newer groups of helping hands. There is the oft-asked question – how did Mr Pang find volunteering with an Indian organisation, despite the language barrier? “It wasn’t really a difficult issue, because my goal was to help others. Without speaking the same language, we were all still able to communicate and get work done. When people from different communities help each other, the social fabric of Singapore gets strengthened and diversified. I feel that’s what we should encourage among the future generations – help your fellow Singaporeans and build a system of support and encouragement. I don’t speak Tamil for now – but who knows, maybe in the future?” he quips.